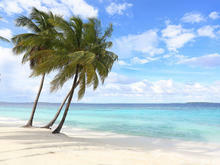 View and book from over 9 villas from 1 USD per night. Book with peace of mind with our Price Guarantee and local customer support. 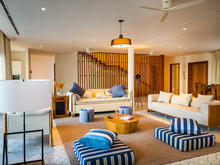 The 4 Bedroom Villa Residence features comfortable bedroom suites, acres of living space, a fabulously equipped kitchen and a private pool right on the beach. 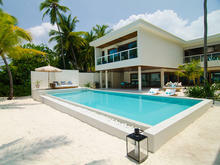 Private, self-contained 4 Bedroom Villa Residences on Amilla Fushi are the perfect holiday choice for family or friends. 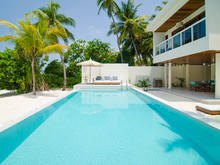 Amilla Villa 4 Bedroom villa is an uber-chic beachfront villa which offers amazing luxury inclusions and sleek Miami-style design in the Maldives. The Amilla Villa Estate’s six bedrooms and numerous living spaces luxuriate across a two-storey U-shaped building framing a 20-metre pool oriented towards ocean views.